London South Bank University (LSBU) has been awarded £77,440 in the StudentshIP Enterprise Awards, a national funding competition by the UK Government's Intellectual Property Office (IPO). LSBU was awarded the funding to deliver the Ignite project, which will support students to improve their understanding and use of IP. The award was conferred by Baroness Lucy Neville-Rolfe DBE, Minister for Intellectual Property, at a ceremony in Bristol which was also attended by representatives of Imperial College London and City University London. The Minister set out her vision that students should have a basic understanding of Intellectual Property as a key part of building a successful, innovative future for the UK economy at the event. LSBU's Ignite project will support this mission by giving students the chance to develop their understanding of IP and put their new found knowledge into practice through a series of inter-disciplinary events to develop innovative commercial ideas. The best ideas will be awarded an Ignite Award to make their ideas a reality. "The Ignite team are delighted to be announced as a winner and believe the project will be a springboard for future activity by linking IP curriculum content to extra-curricular student enterprise activities. The project will also provide annual Ignite awards to help students turn the best ideas into commercial reality," said Linsey Cole, Head of Student Enterprise at LSBU. The project will be closely aligned with LSBU's existing IP awareness programme, which includes workshops and curriculum activities related to IP. The project will maximise the networks and business relationships that have been developed so far by LSBU's IP Manager Syeda Rahimunnessa. "Our economy is increasingly knowledge based, as we now invest more in ideas and knowledge than in buildings or machinery. 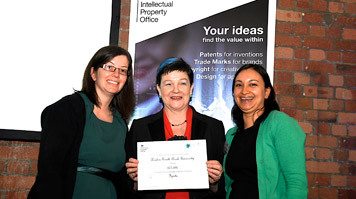 Having an early working knowledge of intellectual property is crucial and we must foster the entrepreneurial capability of the next generation, to secure the UK's continued global competitiveness," said Baroness Neville-Rolfe in her address at the Awards.